A big warm welcome to Jennifer from Stories and Songs in Second who is guest blogging today with some fun ways to help your students with: Hear Ye! Hear Ye! Calling all teachers from far and wide, to and fro, hither and yon! Are you tired of using the same old worksheets and four-corner graphic organizers to teach your students word meaning? Are you looking for ways to transform your daily vocabulary lessons into one of the most engaging, productive, and interactive parts of your instructional day? Then kindly join me for today's royal edition of Adventures in Literacy Land, and listen well, my friends! 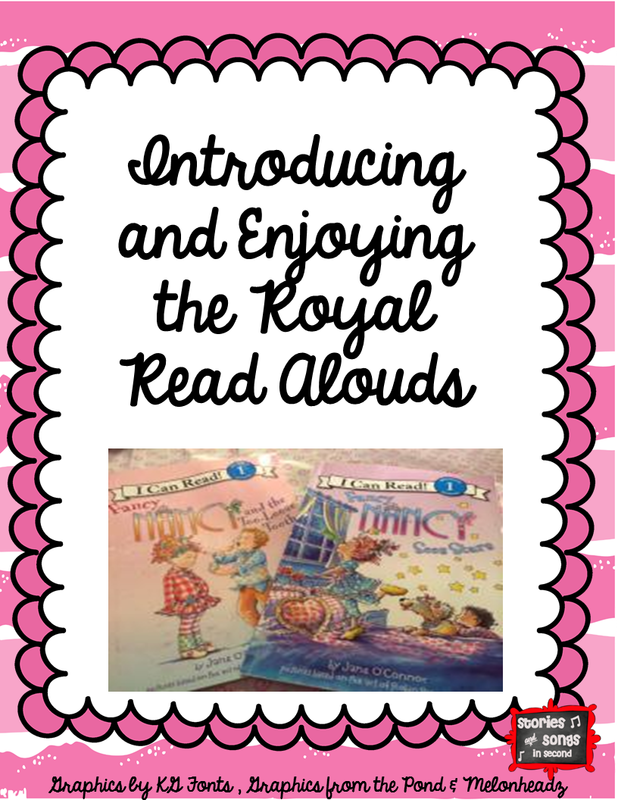 It is I, Jennifer from Stories and Songs in Second, here to share some royal and "oh so fancy" ideas gleaned from a resource that has rejuvenated my own instructional practice! Reading, spelling, writing, and vocabulary work were always my favorite subjects in elementary and high school. The rhythm, rhyme, figurative language, descriptive phrases, and the ability to paint pictures with words always fascinated and enchanted me. My nose was often in a book, or my pen was always being put to paper--writing in my journal, drafting a short story, or composing a poem. My love of all things literacy-related continues today in my classroom, and I am always looking for new methods, strategies, activities, or techniques to capture the attention and interest of my young students. In addition to sharing favorite read alouds from my beloved collection of picture books, I also like to incorporate music into much of my teaching and am not one to sit down at my desk too often. I am known to dance, chant, move, and groove as needed to keep my class focused and engaged. I also have a cupboard full of creative props, puppets, and costumes that I bring out and use as needed. In order to do justice to the content of this post and make this thematic study of BIG words and their IMPORTANT MEANINGS come alive for my second graders, I had to dig deep into my royal treasure box! This book and the simple, effective, and easy-to-implement ideas inside of it has been a "game-changer" for me. After two years of rotating between the same Daily 5 Working with Words activities in Kindergarten and first grade, my second graders were in desperate need of something different this fall. When I stumbled upon Word Nerds by Brenda J. Overturf, Leslie H. Montgomery, and Margot Holmes Smith at my local bookstore, I was at first taken in by the happy, gesturing children on the front cover. The second thing that intrigued me was the rhymed title, and the fact that it described me. I am a WORD NERD through and through! I LOVE VOCABULARY! Whenever one of my students uses a huge "ten dollar word," either in conversation or in their writing, I "kiss their brain." I am also forever spouting a list of alternatives for words we encounter in our daily reading. Needless to say, I scooped it up off the shelf, bought it, and sat down to read it right when I got home. One hundred and forty-seven pages later, I might have even kissed the cover, and then cried a little bit. I was hooked. I had found my kindred spirits. The three teacher-authors, who work at a school with a low socioeconomic population and a high percentage of at-risk children just like I mine, had found a way to reach and teach them the magic and power found in words.They had found a way to foster confidence in children who didn't have any. They still used the tried-and-true methods of close readings and four-corner graphic organizers, but they also introduced an activity called Crystal Ball Words where students look deeply into the prefix, suffix, and root of a word to predict its meaning. They use "themed cycles" of words, instead of lists generated by a basal series, that are based on either a non-fiction text they are reading for a subject area like Science or Social Studies, or a picture book they are studying for Language Arts. Synonym and antonym charts for each of the words listed in the "themed cycle" are created by the students, written on index cards and put in plastic lanyards. A weekly "Block Party" is held, where the teacher calls out the vocabulary word and the child wearing that word on his lanyard needs to invite the children wearing his or her related synonyms or antonyms to the party. Test reviews are called celebrations, and often take the form of a game show like Jeopardy, Deal or No Deal, with students writing the questions and each vocabulary word for the teacher to ask. Sometimes students write a song about their word and sing it American Idol style into a microphone. Sometimes students do the limbo while answering vocabulary questions and then enjoy Hawaiian Punch at a class Luau Party afterwards. Often times, students will act out their words in a Charades-style game. 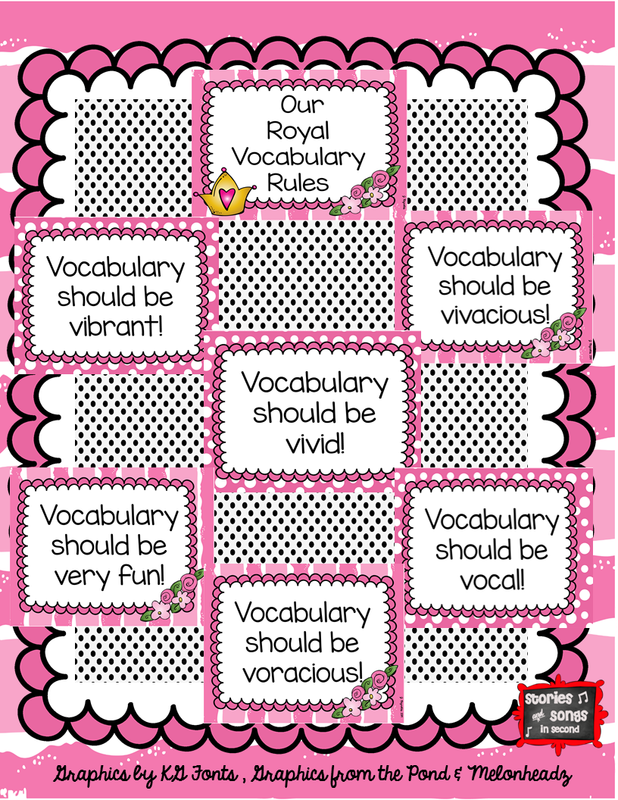 While these activities are just a few of the ideas shared in this resource, Chapter 5 is entitled "Active Vocabulary Practice and is full of innovative, creative, and kinesthetic ways to help children develop the "velcro" they need to understand words and get their meaning to "stick to their brain." Word Nerds also includes a wealth of different formative and summative assessment ideas, planning charts, rubrics, and trade books that can be easily adapted and used in the elementary classroom. Working smarter not harder is something I have learned slowly over my 23-year-career, and I appreciate being able to just pull what I need from the appendix and adapt it as needed. As I started to map out my own implementation plan, I decided to use Fancy Nancy picture, easy reader, and chapter books as my mentor texts because of their rich, royal, and "tres tres chic" supply of synonyms and antonyms. I also appreciate the glossary that is included at the back of each story! They make it easy to create both word and definition cards to use as a before-reading reference in my pocket chart, or to use as a matching review game at a literacy station. Despite her love for all things pink, feathery, sequined, and "girly," the boys in my group adore Fancy Nancy's humor, frequent clumsiness, and her long, arduous laments about how the rest of her family is just so "plain" instead of "extraordinary." My entire group also loves the Razzle Dazzle candies I pass out before we meet the new words in every story! I use them to remind my students how the language we use to express ourselves when we speak, read, and write should be just like the sweet treats in their mouths--fizzy, juicy, flavorful, fabulous, and fun! I also developed this List of Top Ten Royal Vocabulary Rules based on important precepts outlined in Word Nerds to launch or introduce my unit. Please humor my use of alliteration. It just spills out of me, and I cannot help myself. 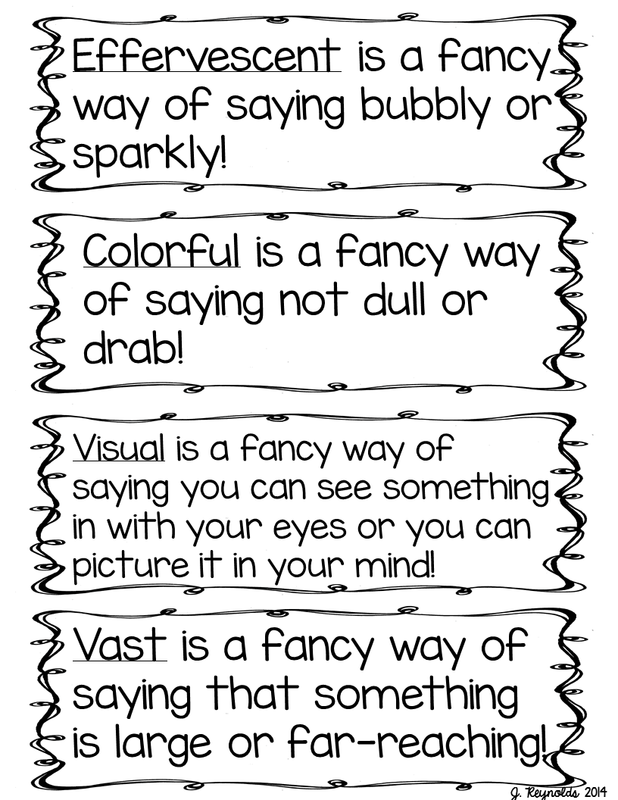 I also decided to emphasize how exploring new words and understanding their meaning is just like unwrapping a present by packaging the words from our first story, Fancy Nancy Sees Stars, as well as the Royal Vocabulary Rules in gift bags. This task of removing the tissue paper and ribbon to "dig deep" inside the bag to unearth the word cards really helped my group grasp how there are often lots of layers or multiple meanings to words that have to be discovered or unearthed! a large ring near our "Thinking Chart," and call student volunteers to come up and read them to their peers. After each rule is read, the entire group shouts out, "Let's make our words fancy! Just like Nancy!" Once we've gone through our rule review and warm-up, student pairs or cooperative groups break off to enjoy a variety of practice activities that are easy for me to prep, and designed to expand and extend their knowledge of the words we are studying. I use little gift bags tied with tags to designate the work areas around our classroom, designate royal helpers to distribute the materials needed for each one from my supply shelves (clipboards, highlighters, Crayola markers, finger trackers, Post-It notes, fun Flair pens, sentence strips, chart paper), assign children to their Word Nerd Work Stations for the day, and then sit back on my royal throne to eat bon bons! Okay.....so I don't actually eat bon bons or sit on a throne during this time, but I do maintain a "I am just going to walk around our royal kingdom in my tiara and watch, listen, wave royally, help if needed, and shower children with praise and compliments" demeanor! Each station has lists of our current vocabulary words and definitions that I've copied and laminated, as well as all of the supplies the students will need to be successful Word Nerds. A short description of each one follows. Please note that it took a LOT of whole-group modeling and practice for each of these activities before my crew was able to work independently during a 20-30 minute time frame. My students take their three-ring binder that is pre-loaded with Handwriting Without Tears paper to their daily station, and then use it as a lap desk if they choose to sit on the floor and work. Worn Out Words--Students generate alternatives for words that are overused in their writing and use chart paper or dry erase boards to generate lists of new ones. For example, a pair of my students came up with this short list of words to use in place of "big"--huge, mammoth, gigantic. Fancy Schmancy Words--Students choose books of interest to them, either non-fiction or fiction, from our classroom library, and use finger flashlights to scan the pages to find interesting or new words inside of them! They then write their favorite words on Post-Its and add them to our Wall of Words to share with the entire class later. Dictionaries are also available at this station for students to look up word meanings. sentence strips to write synonyms for our featured words of the week. Awesome Antonyms--Students sit across from each other knee-to-knee, and gently toss a small Koosh ball or bean bag back-and-forth while calling out an antonym for each word of the week. For example, the first child says "Alfresco means outside." The second child then responds "The antonym for alfresco is inside!" Art Gallery of Great Words display! This then serves as a reference place for the whole class to have a visual clue for each word. I usually cut white construction paper in half for this station, and the students use their own art supply boxes. You could also have your students work collaborative to create a colorful Picture Perfect mural on large chart paper! Art Gallery of Great Words display! This then serves as a reference place for the whole class to have a visual clue for each word. I usually cut white construction paper in half for this station, and the students use their own art supply boxes. You could also have your students work collaboratively to create a colorful Picture Perfect mural on large chart paper! Imagine the possibilities, and encourage them to use the brightest crayons in their boxes! Lights! Camera! Action! Words--Students act out, sing, chant, rap, cheer, or dance to their words. They can clap, tap, or snap the syllables as they say each word out loud. They can make up a jingle to help them remember the word meanings like "I am a constellation! I am a shiny sky sensation!" They can play a game of Charades, where they act out each word for their partner or group to guess and state the meaning. Because this particular set of activities can get L-O-U-D, I recommend that you play it as a whole group in order to maintain decorum and avoid chaos in your royal kingdom! Razzle Dazzle Related Words--Students work together to brainstorm a list of other words that relate to the topic or theme of the word study. Wonder Words--Students "read the room" with a partner--book titles, anchor charts, our Word Wall, labels, etc.-- and write down four favorite words. They then either "turn and talk" to their neighbor about their words, and state the reason they like each one. After that, they must "show what they know" by writing "superhero sentences" for each word. If you'd like to take your students for a magical ride in my royal vocabulary carriage, I will have this FREE starter kit uploaded to my store very soon! It will include the word power cards, anchor charts, and posters described in this post. or on the picture below to grab your copy! In closing, I'd like to share one more piece of information that is connected to my personal vs. professional life. It served as the thematic inspiration for this post, and is "tres tres" good news that I just simply must share! Thank you in advance for indulging me! Know that I cannot wait to applaud her performance as she helps bring skits, songs, and dances about one of my favorite books characters to life! It honestly makes my teacher and Drama Mama heart swell with pride! Wow, what a royally wonderful post! So many kids just skip words they don't understand or can't read. I enjoyed reading how you inspire a love for vocabulary. So glad I stopped by to get a glimpse into your vibrant classroom. Your kind comments are always appreciated, Sebrina! I hope you were able to get some fun ideas on how to inspire your students to be "word nerds!" Great post Jennifer! Great to see you hanging out in our Literacy Land. What a great and fun way to work with vocabulary and congrats to your daughter- that is awesome! Thanks for your kind feedback on my post, Jennie! I am thankful for the opportunity to share on one of my favorite blogs! You royal gals inspire my teaching! Thanks also for the kind congratulations on my daughter's opportunity! I can't wait to see the show this winter! I am hope your pre-service teachers will run right out and buy their own tiaras......and possibly a pink feather boa, Kylie! Know that I appreciate your support and positive input about my ideas and resources! It makes me feel "tres tres fancy!" Fantastic post, Jennifer! 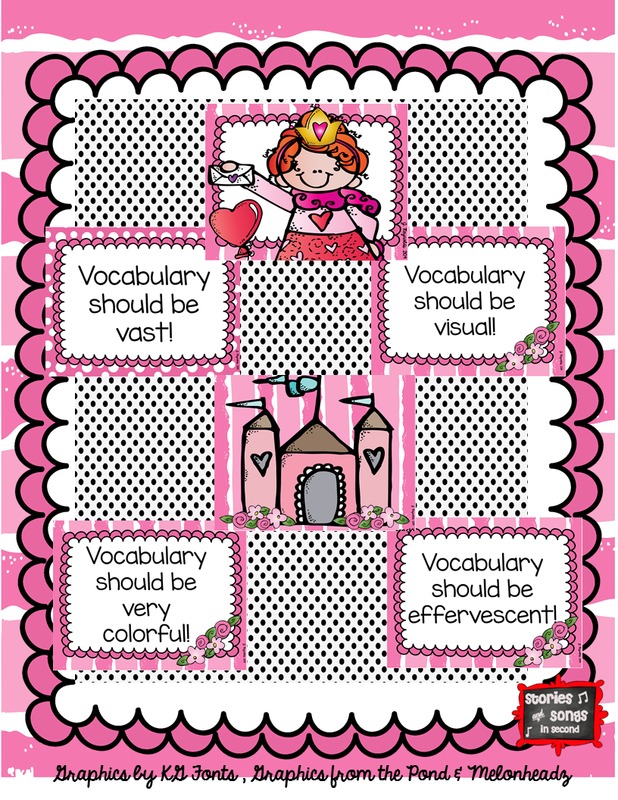 Full of tremendous-phenomenal-magnificent ideas for vocabulary building. 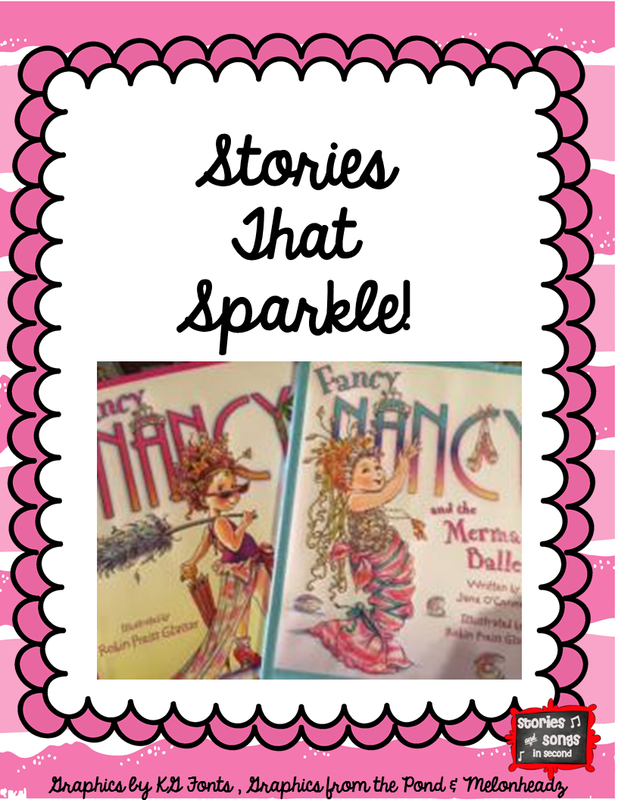 ;) Fancy Nancy books are definitely a superb resource for this topic. Thanks for sharing your vocabulary talent! Nerd is the word when it comes to me and vocabulary, Colleen! Yesterday, I told my second graders that I didn't appreciate their "shenanigans" in the restroom--and a 10-minute brainstorm of synonyms and antonyms for my "tres tres fancy" word ensued! Know that your kind comments are greatly appreciated, and that I hope my ideas and supplemental resource will be useful for you! Oh My!!! What a great post! You have provided me with so many ideas for vocabulary, which is certainly a weakness of mine! We start our Fancy Nancy study next week!! Yea!!! I am SO glad you enjoyed my ideas, Em! I hope that the materials in the freebie will be useful with your firsties as well! Let me know if I can create anything "extra" you can need for your thematic study!